The diet served to the convicts is, for breakfast, cocoa shells boiled, and sweetened with molasses, and rye bread; dinner, ox-head soup, and the meat attached to the head, with potatoes and rye bread, some times salt meat and peas; supper, mush and molasses. The cost of the breakfast, dinner and supper, is from 5 to 6 cents per man per day. From this description of the food served to prisoners, I tracked down recipes for these meals in cookbooks from around the same time period. The recipes may not exactly reflect what was served to the prisoners–my guess is that less care and fewer quality ingredients went into the preparation of their meals–but they should give an idea of what the prisoners regularly ate. 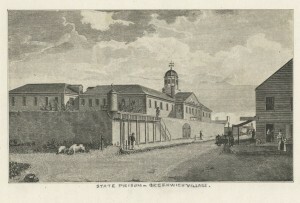 Newgate Prison was one of the earliest penitentiaries in the United States. 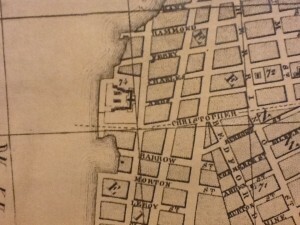 It was located on what is now 10th St. and Washington St. in New York City, with Charles St. and Christopher St. marking the north and south borders of the prison, respectively. The prison was founded in 1797 and lasted until 1828, when prisoners were transferred to the newly built Sing Sing Prison further up the Hudson River in response to overcrowding and frequent riots at the old state prison. I do not know if the food served at Newgate Prison figured into any of the unrest, but with these recipes you can recreate for yourself the diet of convicts who served time there and decide for yourself. Take half an ox head, and cut the cheek clean from the bones, break the bones to pieces, and put them in a large pan of water all night to soak out the blood; in the morning wash them clean out, and put them into a pot with six quarts of water, when the scum rises skim it well; take six onions, six heads of cellery, about four leeks and two turneps, well washed and cut in two, with a bundle of sweet herbs, a spoonful of all-spice, some cloves and mace, and a little salt; put in two palates, and stew them till tender, then take them out and throw them into cold water, and take off the skins; cut them into square pieces, stew the head five hours, try if the head is tender, if not stew it gently till it is; then take it out, and strain the soup into a pan to settle, skim it well, and pour it from the settlings; put a quarter of a pound of butter in a stew-pan and melt it, put two large spoonsful of flour in, and stir it about till it is smooth; by degrees put the soup in, keep stirring for fear it should go into lumps, if it does you must strain it through a sieve, put in half a pint of white wine, and season it with Cayan pepper and common pepper and salt, nearly as hot as mock turtle; in the mean time cut a carrot and two turneps in dice, four heads of cellery and two leeks about half an inch long, toiled in water till tender, strain them in a sieve, and put them to the soup; cut the cheek in square pieces and put it in with the palates, and two spoonsful of browning, stew it gently for half an hour, and skim the fat off clean; put it into a soup-dish or tureen, with crispt bread in a plate. N.B. You may put the cheek whole in a large soup-dish, if you like it best, and the soup over it. Wash them very clean, put them into a sauce-pan, nearly cover them with cold water, put in a little salt, cover them close, and boil them very gently, but look at them often; when the skins begin to break try them with a fork, and if they are done strain the water from them, cover them close to steam for a few minutes, then peel them, and put them in a dish, with melted butter in a boat. Or thus: pare them first, wash them clean, and put them into a sauce-pan with a little cold water, cover them close, boil them very gently, and look at them often, that they do not break to pieces; strain the water off, and put them into a dish, with melted butter in a boat. As many people have various ways in pickling pork, it is almost impossible to give directions for pickling it; some people love it pickled with plain salt, legs especially; others in this manner: have a tub, and lay a layer of salt at the bottom; then mix one third of salt-petre beaten with two thirds of white salt; cut your pork in pieces, rub it well with the salt, and lay it close in the tub, with a layer of salt between every layer of pork, till the tub is full; then have a cover, just large enough to fit the inside of the tub, put it on, and lay a great weight at the top, and as the salt melts it will keep it close; when you want to use it take a piece out, and mind to put the cover on again, and it will keep good a long time. Have your peas shelled as near the time you want to dress them as possible: have boiling water in a sance-pan, put in the peas, a little salt, a small knob or two of sugar, and a sprig or two of mint, boil them quick, and when they dent they are done; strain them in a sieve, take out the mint, and put them in a dish; have a little mint boiled by itself chopped fine and put round: or you may put some butter in the dish, and stir them up till it is melted. You may broil some thin slices of ham and lay round if you please. Briggs, Richard. The New Art of Cookery, According to the Present Practice. 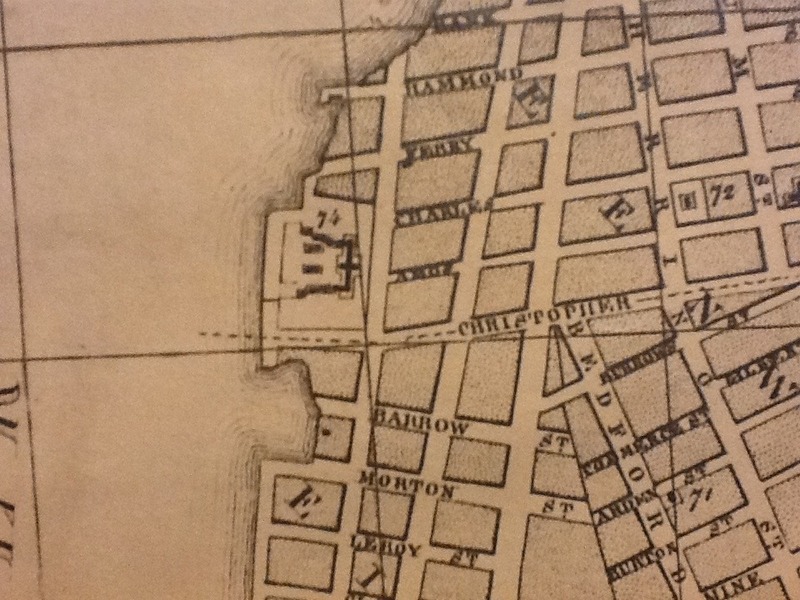 Philadelphia: W. Spotswood, R. Cambell, and B. Johnson, 1792. Database: America’s Historical Imprints: Readex/Newsbank. Emmet, Thomas Addis, “Newgate Prison, Greenwich Village, 1801,” Greenwich Village History, accessed October 1, 2014, http://jonreeve.com/dev/gvh2/items/show/559. Lincoln, D. A. Mrs. Lincoln’s Boston Cook Book: What to Do and What Not to Do in Cooking. Carlisle, MA: Applewood Books, 1833 [reprint]. Report of the Inspectors of the State-Prison. Albany, NY: Loring Andrews, . Database: America’s Historical Imprints: Readex/Newsbank. This was written by Anthony Vaver. Posted on Thursday, October 2, 2014, at 8:43 am. Filed under Prisons and Punishments. Tagged Criminal Justice System - America, Imprisonment, New York, Prisons and Jails. Bookmark the permalink. Follow comments here with the RSS feed. Post a comment or leave a trackback.